Things have gone from bad to worse for UKIP in the East Midlands. Derek Clark MEP is currently under investigation by the EU’s anti-fraud office and could face legal action before June 2009. Any prosecution is bound to destroy once and for all UKIP’s last hope of getting an MEP re-elected in that region. After all, who would want to vote for a party that can’t even guarantee the probity of its MEP’s? 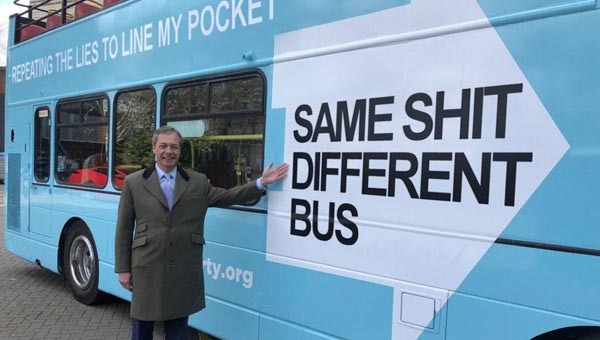 I can recall that Nigel Farage once claimed that UKIP would be whiter than white. How times have changed. So much for being different from the other parties! Branches in the region are also struggling. Leaflet drops are failing to attract support. Indeed, members are openly rebuffed by the public when they try to hand them UKIP literature. To make matters worse the East Midlands Regional Committee has only a few thousand for the Euro elections. My sources tell me that they have as little as £6,000 in the bank. Ancient news junius. But I guess you are running out of sources given that many of them know they've been rumbled. You talk of corruption and dishonesty but your whole approach is corrupt and dishonest, and those who conspire with you are no better. Honesty and transparency would be those who claim evidence, to be open and make those claims, surely being excluded from a corrupt party is a price worth paying to rid the party of that corruption. However we know you speak with a 'forked' tongue don't we.